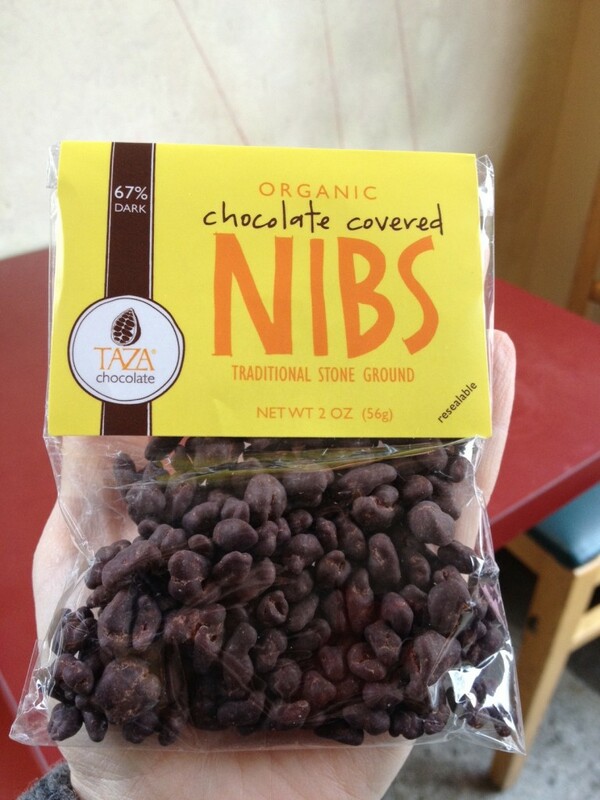 This week’s Accidentally Vegan feature is… Organic Chocolate Covered Nibs by Taza Chocolate! I found this yummy little surprise right near the checkout counter at the Whole Foods in Pittsburgh over the weekend. I wasn’t sure exactly what these were, but I thought: vegan chocolate, organic, and stone ground… it’s gotta be good! And oh yes, these organic chocolate covered nibs were absolutely O-M-G good! After shopping, I wandered over to the 61C cafe to meet a friend and do some work… but all we could do was eat the nibs and talk about how awesome they were!!! What makes these little chocolate morsels from heaven so amazingly yummy? Well, first, the actual chocolate itself has a fruit undertone. (Maybe it’s the organic cacao beans?) Both my friend and I were amazed at the deep, fruity flavor of the chocolate, especially because the only ingredients listed were: organic dark chocolate (roasted cacao beans, cane sugar, cocoa butter, vanilla bean), organic roasted cacao nibs! Second, along with the rich, deep chocolate, you get the crunch of the nibs! This product is not labeled as vegan, but the ingredient list shows that it is dairy-free chocolate. These chocolate covered nibs are vegan, gluten-free, and soy-free too. And because they are labeled as “organic,” I know that they used vegan sugar. Yay! I found these Taza organic chocolate covered nibs at the local Whole Foods in Pittsburgh. If you can’t find them at a store near you, it looks like you can also buy them on the Taza website. I am really excited about this new Accidentally Vegan find! We all know what will be in my shopping basket next week. YUM!